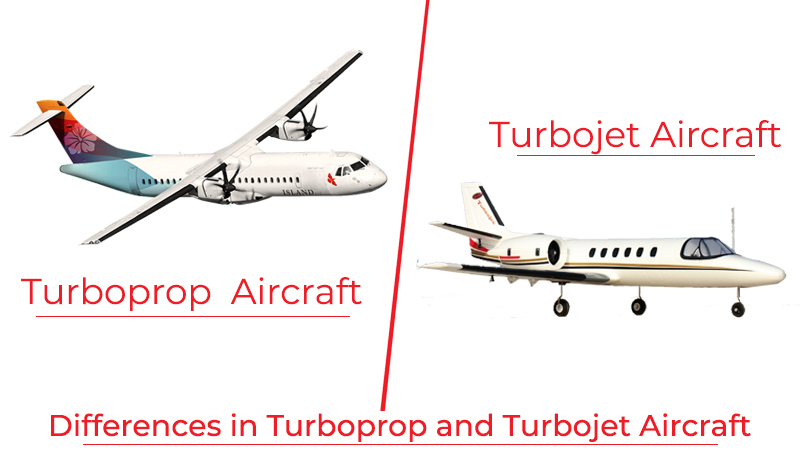 Aircraft buyers or first time charter users often contemplate on the differences between flying a turboprop or a turbojet aircraft.Typically, flyers often refer to turboprop as engines with fans. While both types of power plants have their own advantages, the real benefits can be assessed only after reviewing the mission requirements. 1. Highly fuel efficient at lower altitudes: Turboprop engines push a large amount of air through the fans (propellers) in denser air at lower altitudes. The specific fuel consumption, i.e. thrust produced per pound of fuel is higher for turboprops as compared to turbojet engines. Hence if the flight missions are short and require flying at lower altitudes, say below 25,000 ft. then from economic perspective, turboprops will deliver better fuel efficiency. 2. Better short and unpaved runway performance: Turboprop aircraft have lower landing speeds and hence can land on short runways. Some airplanes such as Twin Otters can land on runways which are less than 1,000 feet in length. In addition, turboprop aircraft are better suited to unpaved runway conditions. Dust and other FOD objects have a significant impact when ingested into turbojet engines thereby causing extensive internal damage. A key advantage of the above is that a lot of airports which have shorter runways become available for turboprop aircraft operation which normally could not be accessed by turbojet airplanes. A key example in India is that of Jamshedpur, a major industrial city. The airport in Jamshedpur can only accessed by turboprop aircraft. 3. Cost effective operations: Turboprop aircraft have lower acquisition costs and operating costs. Hence the lifecycle operation costs of turboprop aircraft are lower as compared turbojet aircraft in comparable segments. In addition, if operations require short flights with few passengers, then turboprop aircraft are comparatively far more efficient and cost effective. Turboprops are 20 to 30% slower as compared to jets in the same class. Hence they take longer time to complete any trip. Therefore the operating cost of the trip becomes only marginally lower as compared to turbojet. For any person whom time is of essence, flying a turbojet at a small premium becomes more desirable as compared to flying a turboprop aircraft. 2. )More cabin noise and vibration: Due to two large moving fans which are outside of the core engines, turboprops produce more noise and vibration as compared to turbojet airplanes in similar segments. This is a major turnoff to working executives who like to get a lot of work done on the airplane while traveling on business. Aircraft that are powered by turbojet engines where performance in terms of speed, power and range are the prime requirements. 1) Higher speeds: Turbojet engines are installed where speeds in excess of 375 knots and above are required. There are examples of slower aircraft though. But generally, as a thumb rule, turbojets are preferred to cover long distances over shorter period of time. 2) Higher altitudes: As opposed to turboprop engines, turbojets are designed to operate on efficiently at higher altitudes. Commercial airliners operate higher than 35,000 feet during cruise to save fuel during the longest phase of flight. Another huge advantage of flying higher is that the airplanes are normally not impacted by en-route weather conditions as they fly higher where impact of changing weather is minimal. This results in a comfortable flight experience for the passengers. This is the biggest advantage that a turbojet has over turboprop aircraft, which are faced with turbulent weather during cruise conditions. 3) Lesser cabin noise and vibrations: The fans of the turbojet engines are enclosed inside the engine cowling and hence contain the noise from the engines. This results in a quieter cabin experience and lesser vibrations. In fact mostly noise in a turbojet aircraft is due to the air passing over the fuselage. 4) Longer range: The range of turbojet aircraft can go up to 8,00 nautical miles as in the case of Gulfstream 650ER. Such range allows for non-stop flight operations between Delhi and New York. This not only saves time due to layover, but the overall cycles of the airplane are also reduced significantly. 5) Lower operating costs for large pax capacity: When it is required to transport large number of passengers over long distances, then turbojets are highly cost efficient in such operations. Thus, the selection of turboprop versus turbojet aircraft is dependent on the mission requirements. A highly analytical approach requiring route profitability analysis needs to be carried out for airlines and mission requirements needs to be assessed for business aircraft when selecting the right kind of aircraft. Arrow Aircraft is a business aviation company providing sales and charters of business aircraft and helicopters. Our structured ‘5 Step Aircraft Acquisition Process’ enables our clients to have a better and transparent understanding of the aircraft selection process.